One-third of the 112 most important sites for nature in South Africa are facing imminent danger of irreversible damage, according to a new South African IBA Status Report published today by BirdLife South Africa. 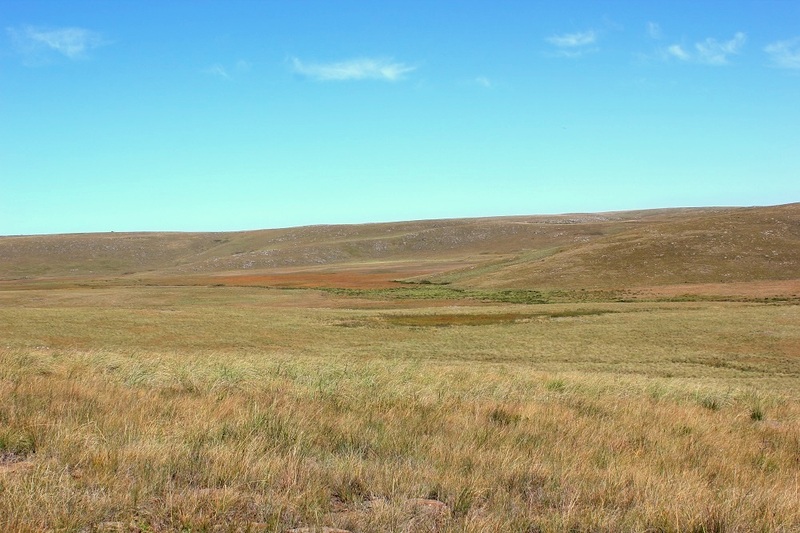 These sites – known as Important Bird and Biodiversity Areas (IBAs) – are threatened by invasive species, changes in habitats through incorrect burning practices, and agricultural expansion or mismanagement. 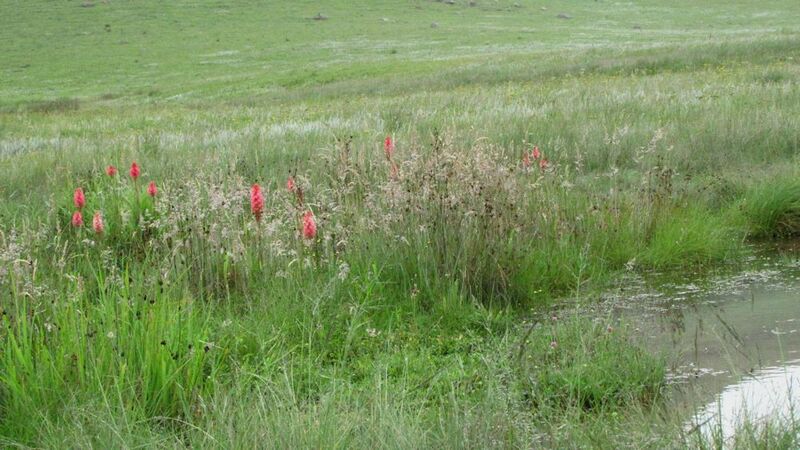 Unprotected IBAs in particular are deteriorating at a concerning rate, most especially in grasslands, wetlands and fynbos, but habitats in protected IBAs are also showing signs of deterioration. Over 85% of all IBAs face high to very high levels of threats, and there is little distinction between protected and unprotected IBAs in this regard. The IBAs with the highest and most imminent threats will be included in BirdLife International’s list of IBAs in Danger, the global list of priority sites identified for urgent action. This South African IBA Status Report is accompanied by a revised National IBA Directory, building on and up-dating the first such inventory published in 1998. It provides updated information of the most important aspect of each of these 112 IBAs, including the geography and climate of the area, the list of the bird species found at the IBA, the biggest threats to the site, and what conservation action is taking place to secure the IBA. This publication can be used by conservation practitioners and planners to prioritise their work, by developers who need to understand the sensitivity of an area, and can even be used by bird enthusiasts to plan a birding trip. 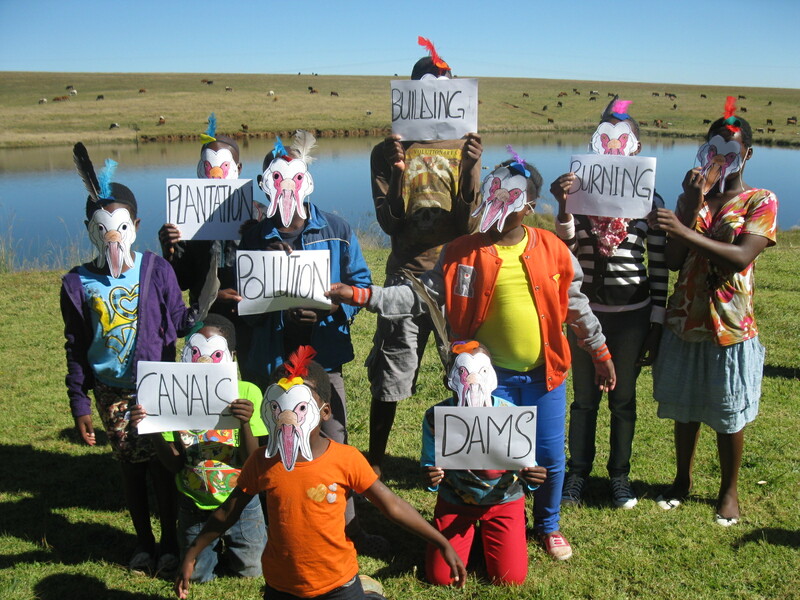 The 112 IBAs in South Africa are the last stand for bird conservation on a landscape level. Protecting these sites has benefits not only for South Africa’s birds, but also for other animals, plants and the vital ecological services these sites provide to people. These services include providing us with fresh water, managing floods, controlling disease, and providing grazing lands for livestock farming. Conserving IBAs is also important for attaining our government’s environmental commitments like the Convention on Biological Diversity’s Aichi Target 11 that calls for the expansion of terrestrial Protected Areas by at least 17%, and the Convention on Migratory Species. Therefore, their deteriorating status is a very high concern which requires immediate attention from government agencies and other stakeholders. The main recommendations from the IBA Status Report to remedy this situation include that government needs to allocate more resources towards managing protected areas and expanding the protected areas network through biodiversity stewardship. That IBAs should be used as a first cut when identifying priority areas for conservation, including for protected area expansion. By following the published management guidelines, the agricultural sector is able to manage their lands for the parallel purposes of producing livestock, improving veld condition and conserving biodiversity. IBAs should be considered as red flags and often exclusion areas when other development options are being considered, such as mining. While both these publications are milestones for bird conservation, they need to be seen as the spearhead which will now be used to lobby, plan and implement effective conservation for birds, their habitats and other biodiversity. Both the revised IBA Directory and IBA Status Report can be bought in hard copy from BirdLife South Africa’s IBA Programme (011 789 1122, daniel.marnewick@birdlife.org.za), or the electronic versions can be downloaded for free from: http://www.birdlife.org.za/conservation/important-bird-areas/documents-and-downloads. For further information please contact Daniel Marnewick at daniel.marnewick@birdlife.org.za (011 789 1122). 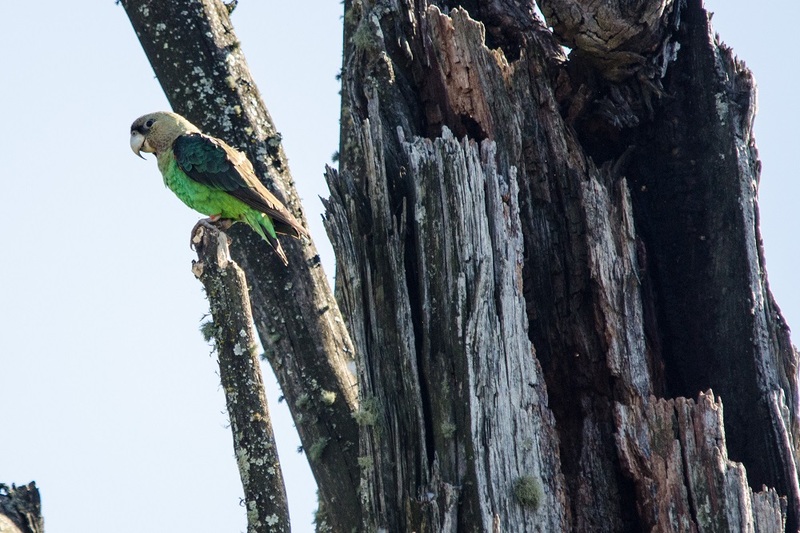 This entry was posted in Feathered Friends and tagged birdlife south africa, birds, cape parrot, IBA, Mist belt forest, mist belt grassland, wetlands on September 17, 2015 by Midlands Conservancies Forum. 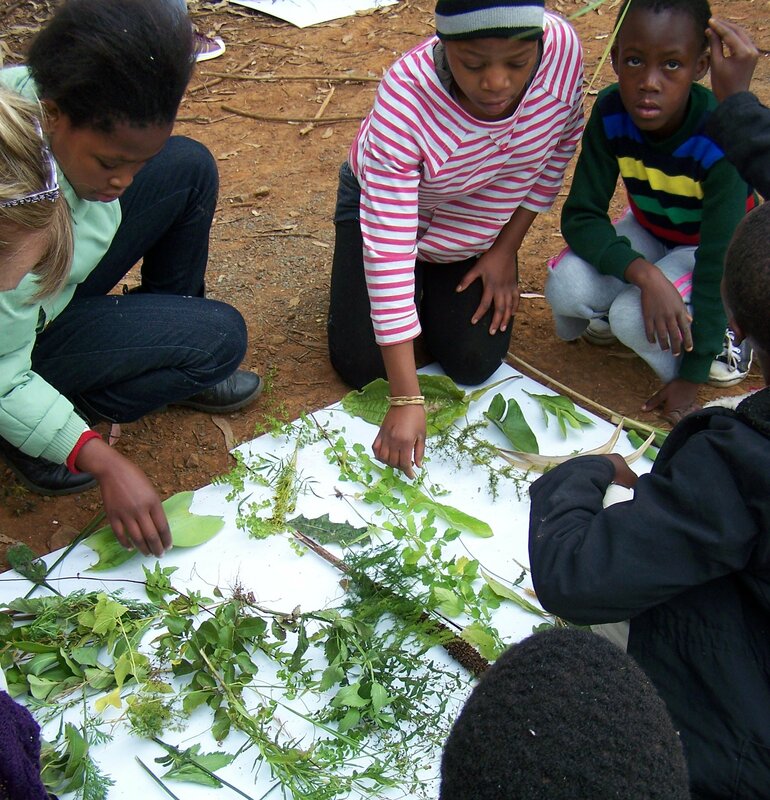 Each Conservancy in the Midlands does different activities to strengthen environmental awareness and learning in the region. 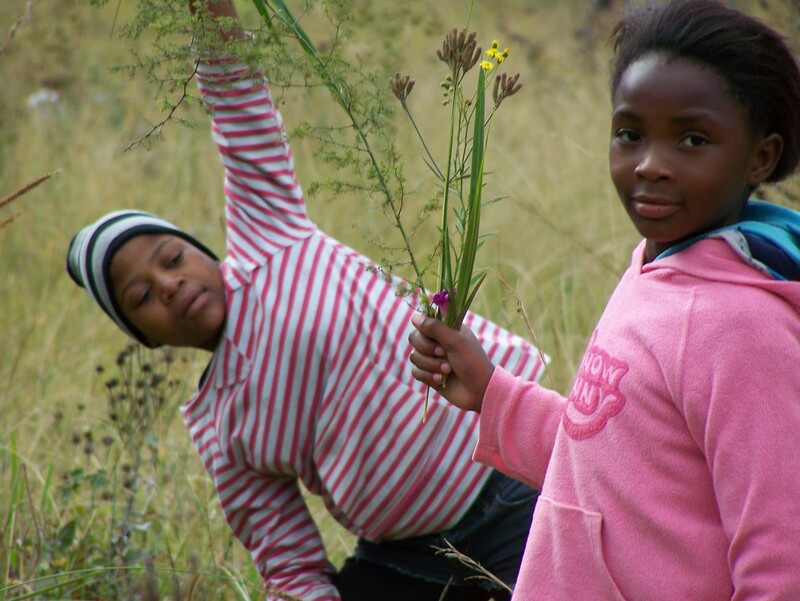 N3Toll Concession is delighted to fund many of these activities through the Midlands Conservancies Forum (MCF) Environmental Learning and Leadership Programme. MCF believes that in order to protect precious eco-systems and the goods and services that they provide to society, it is important to educate and inspire our communities, and young people in particular, to understand and value them. 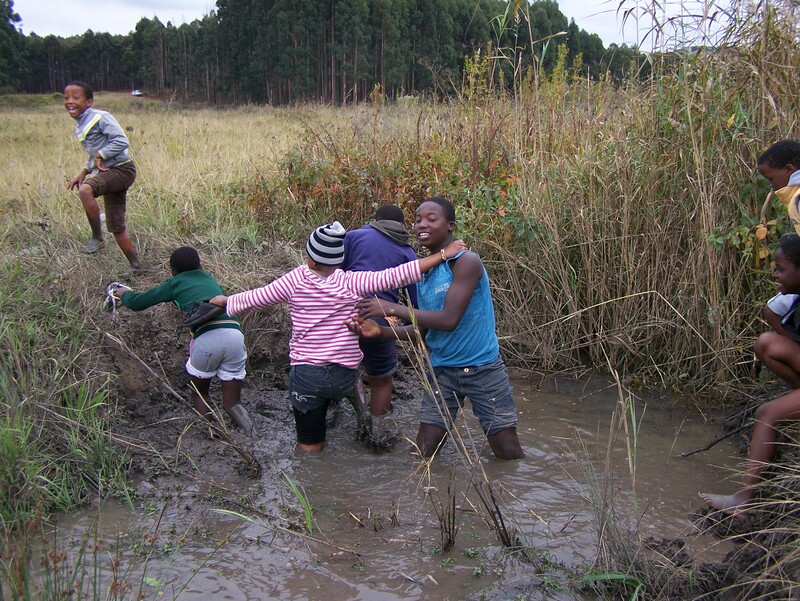 Bill Barnes Crane and Oribi Nature Reserve – home to the KZN Crane Foundation – has started an Enviro Club for the children who live around the 450ha reserve with their allocation of the MCF funds. 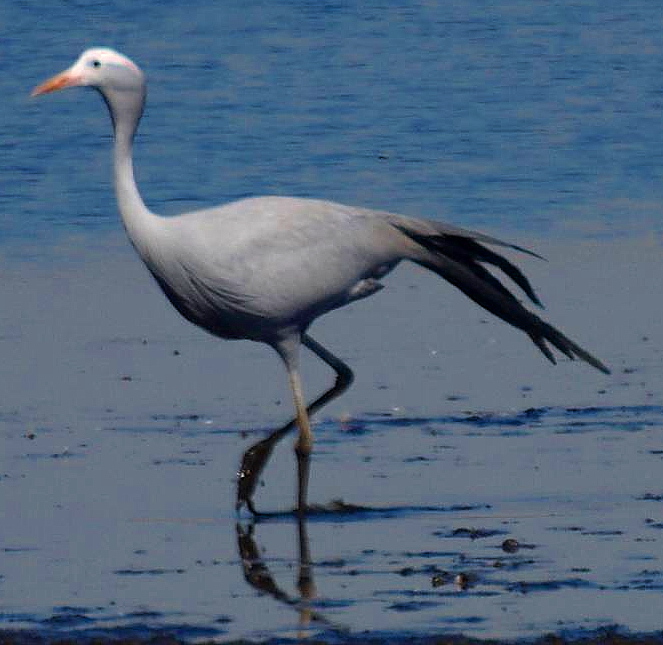 KZNCF believe that it is important that everyone understands the importance of the grassland and wetland eco-systems which are a feature of the Reserve and the habitats they provide for endangered cranes. 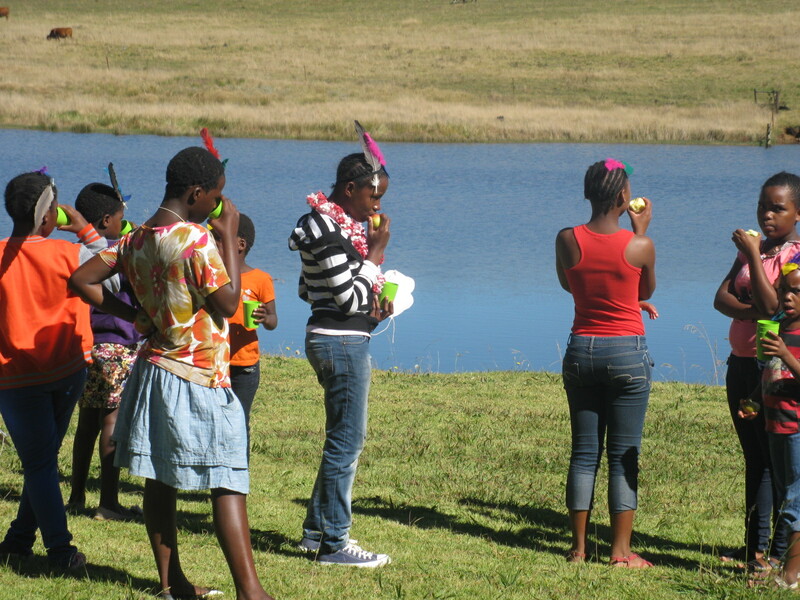 On the first day (a sunny autumn Saturday) 19 youngsters aged between 10 and 16 were welcomed by Nkanyiso Ndlela, Environmental Education facilitator for KZNCF. After an explanation about Reserve and the work of the Crane foundation, there was a lot of discussion on a suitable name for the new club. Beautiful Cranes Nature Club got the most votes. Everyone helped make up some simple rules for the club which included being on time, respecting the Reserve and one another, and no littering. 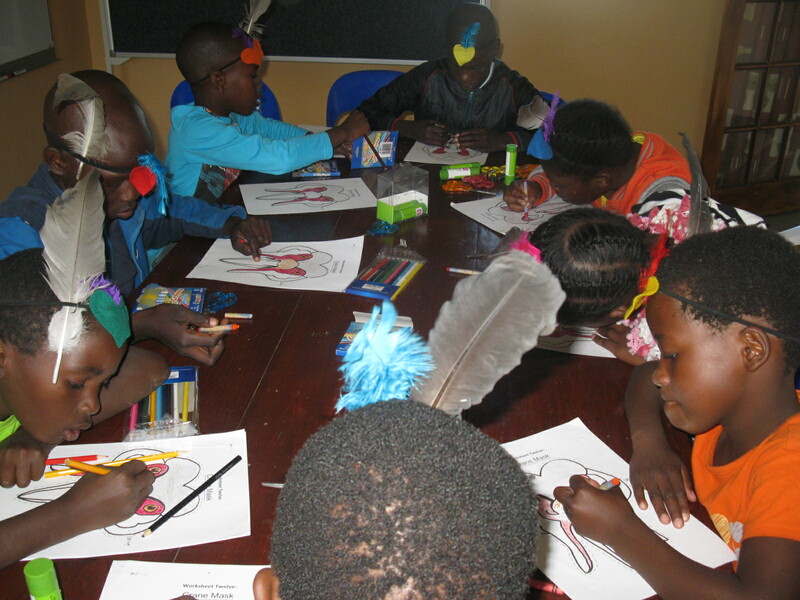 Nkanyiso asked the children what activities they hoped to do with their new club and a wide selection of ideas were recorded. These ranged from learning more about wetland plants, doing drama and singing, to going on environmental trips. 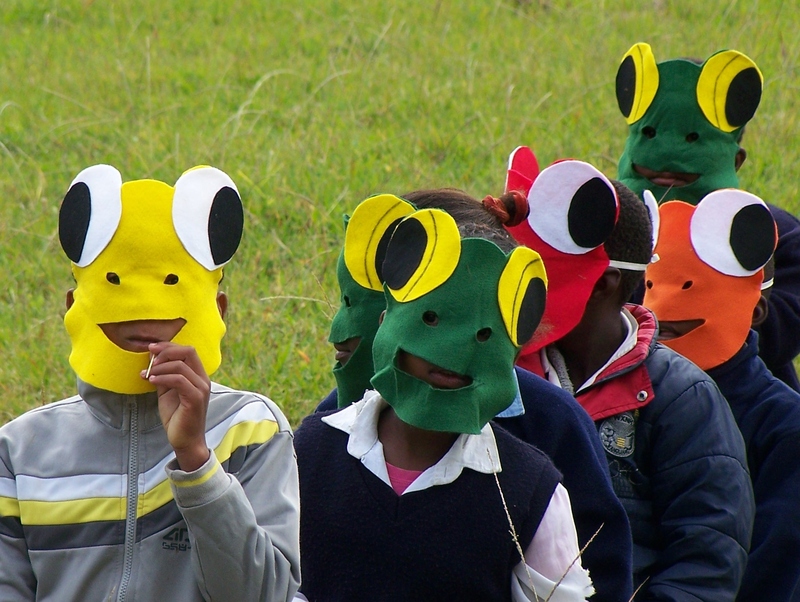 The first activity of the day was making Wattled Crane masks. With the new Wattled Crane Nursery (almost ready to receive chicks) in the distance, this was an ideal opportunity to chat about the vulnerability of the last few hundred Wattled Cranes in the wild. 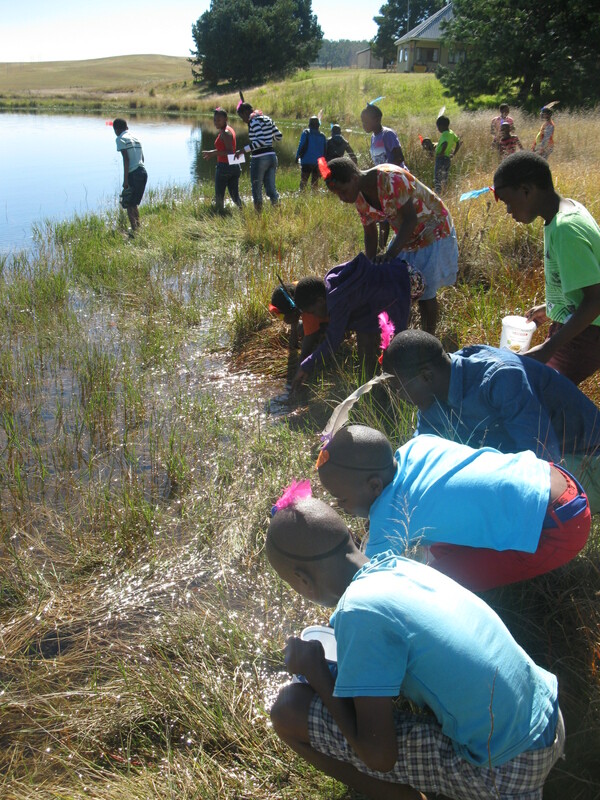 The final activity was based on the importance of wetlands and involved getting feet wet to discover the plants and animals that occur in the wetland on the Reserve. 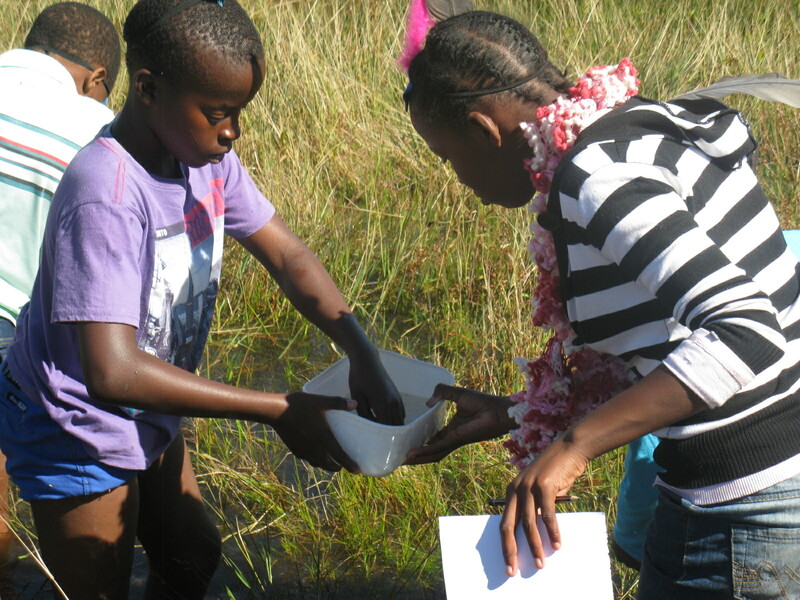 Everyone had great fun and found frogs, water beetles, sacred ibis, incema, imifino, a grey heron and tadpoles. 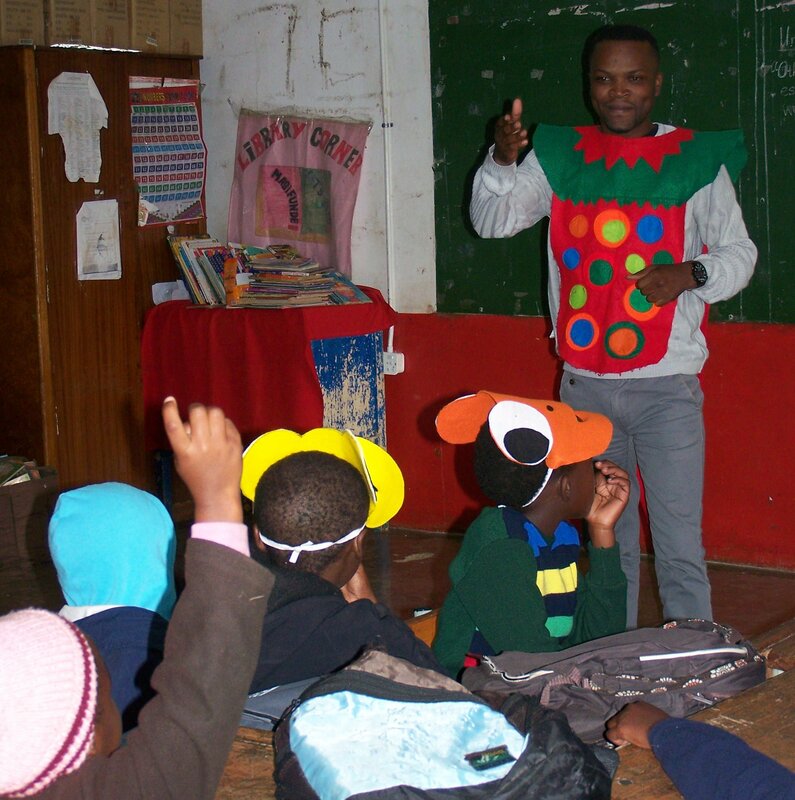 Nkanyiso hopes to inspire other young people interested in the environment, and show that with dedicated effort, they too can follow their dreams. The Beautiful Cranes Nature Club is a great start. 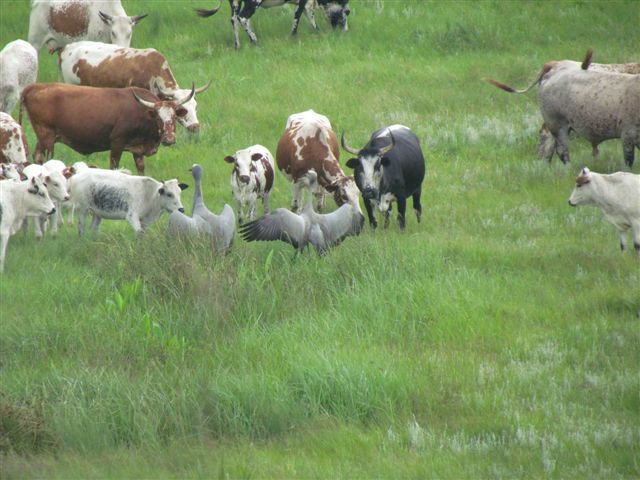 This entry was posted in Environmental Learning and tagged cranes, environmental education, wetlands on May 15, 2014 by Midlands Conservancies Forum. 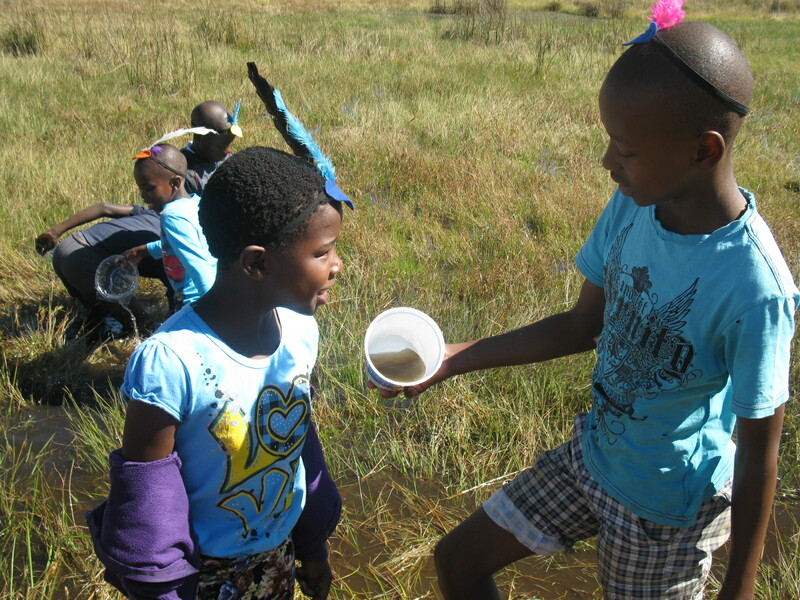 Nkanyiso Ndlela is passionate about wetlands. 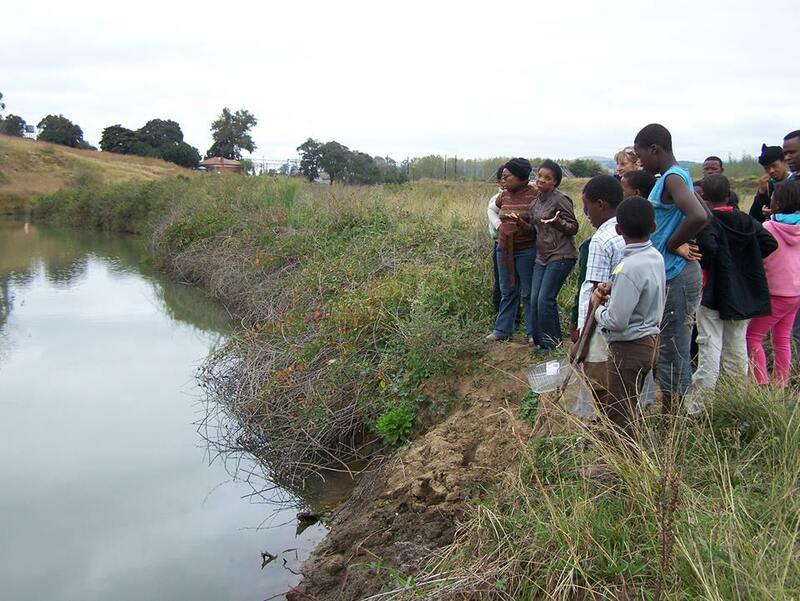 He is the environmental education officer for the KZN Crane Foundation in Nottingham Road. In an effort to inspire others to care for this precious resource, he wrote this article. Noma-ke amaxhaphozi edlala indima enkulu ezimpilweni zabantu, njengokuhlanza amanzi, ukusiza ekuvikeleni ukuguguleka kwenhlabathi, ukugcina amanzi, futhi aphinde abe ikhaya lezitshalo kanye nezilwane ezinhlobonhlobo ezithembele kuwo amaxhaphozi ukuphila, njenge nyoni ethathwa njenge nyoni yesizwe sase Ningizimu Africa, Indwa (blue crane) umdwebo wayo obonakala emalini yalapha eNingizimu Africa uzukwa (5cent), Izimpaphe zayo ezise sisileni ebezifakwa inkosi uShaka ekhanda njengophawu lokukhombisa ubukhosi. kodwa ukungawanakekeli nokuwasebenzisa ngendlela engafanelekile kusaqhubeka. Amaxhaphozi angumthamo wempilo yokulawulwa kolwazi. 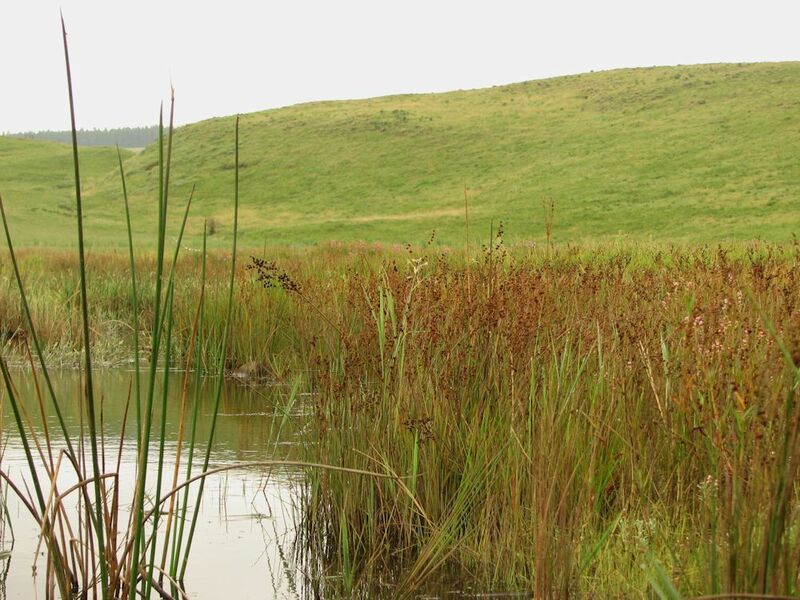 Abesetshenziswa izigidi zeminyaka edlule, kudla kuwo imfuyo, njenge ndawo ekutholakala kuyo izitshalo ezinjengo uMhlanga (Phragmites australis), iNcema (Juncus kraussii), iMisi (Cyperus textillis), iKhwane (Cyperus latifolius), njalo njalo ukufulela izindlu, ukuluka kanye nokuthunga amacansi, obhasikidi. Aphinde abe indayo lapho kunga dotshwa khona kanye nendawo yokwenza ucwaningo lwemfundo. Ngaphandle kwamanzi impilo ngabe ayikho emhlabeni. Izitshalo, izilwane kanye nabantu badinga amanzi ukuze baphile futhi nokukhula. Iningizimu Africa ayisenawo amanzi ahlanzekile amaningi kanti amanzi amaningi asemihosheni kanye nasemifuleni angcolile. Imiphakathi iyanxuswa ukuba ibambisane nezinkampani ezilungisa ziphinde zinakekele amaxhaphozi ngokuwasebenzisa ngendlela efanele okanye ngendlela enenqubekela phambili. Izindlela-ke abantu abalimaza okanye abaphazamisa ngazo ukusebenza kwamaxhaphozi njenge ndawo eyimvelo ziningi kakhulu, njengokulahlwa kwa doti kuwo, ukutshala kuwo ngaphandle kokulandela imigomo nemi bandela, ukwakhiwa kwemigwaqo nama damu ngendlela engafanele, ukudlisa imfuyo nokushisa imililo ngendlela engafanele, ukwakhiwa kwenxanxathela yezitolo ezindaweni eziseduze kwamaxhaphozi ngaphandle kokulandela imigomo nemibandela, ukusetshenziswa kwezitshalo zasemaxhaphozini ngendlela edlulele okanye eyeqile. Ucwaningo olusanda kuvezwa ngamaxhaphozi, adlala indima enkulu ekunciphiseni umoya ongcolile emhlabeni okanye emkhathini eyaziwa nge(carbon dioxide- CO2) kanye ne (methane-CH4) Ebangwa izimboni ezikhiqiza ugesi, ukusikwa kwezihlahla, ukushisa udoti, njalo njalo. Lokungcoliswa komhlaba okubangela ukufudumala komhlaba ngokungafanelekile okugcina kubangele ukushintshashitsha kwesimo sezulu ngokuthusayo nokunga jwayelekile okunomthelela omkhulu omubi ezimpilweni zabantu kanye nasezitshalweni. Amaxhaphozi-ke kuyavezwa ukuthi ayasiza kakhulu ekuvimbeni lemimoya engcolile iwugcine ngaphansi kuwo ngokwenvelo, uma engahlukumezekile okanye uma engaphazamisekile ukusebenza kwawo ngokwemvelo. 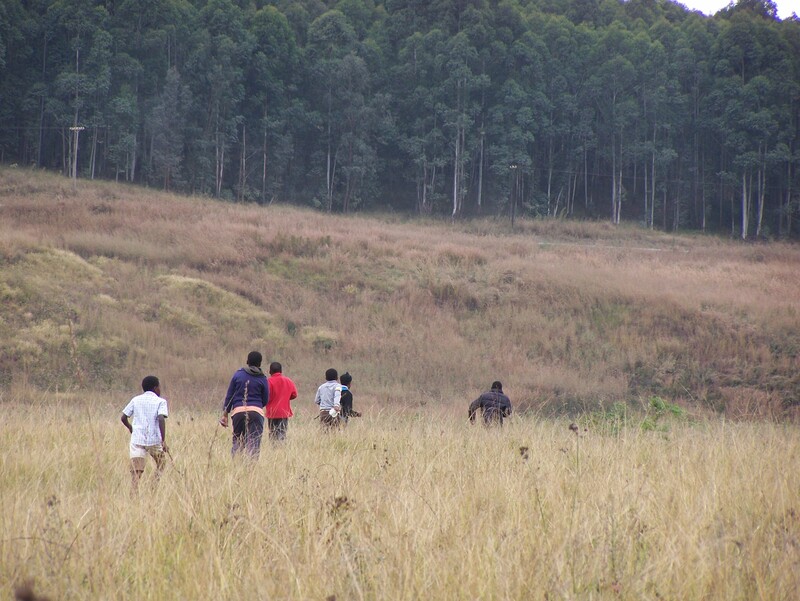 This entry was posted in Uncategorized and tagged wetlands on April 9, 2014 by Midlands Conservancies Forum.